Amazon is the largest internet-based retailer in the world. Hard to believe it began life as an online bookstore. Nowadays, it sells just about everything. One of the keys to Amazon’s success: its obsession with customer service. 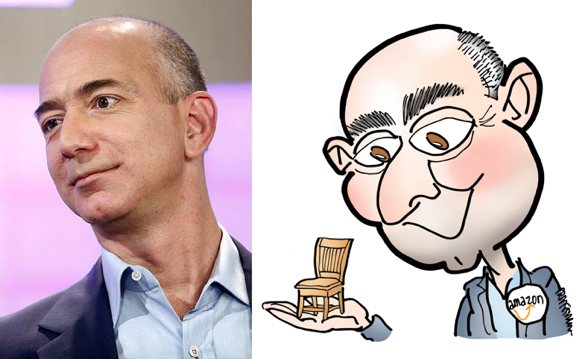 Amazon CEO Jeff Bezos is famous for having an empty chair at company meetings. It represents The Customer: the most important person in the room. Make it easy: if a customer has to struggle to place an online order, you’ve lost that person. 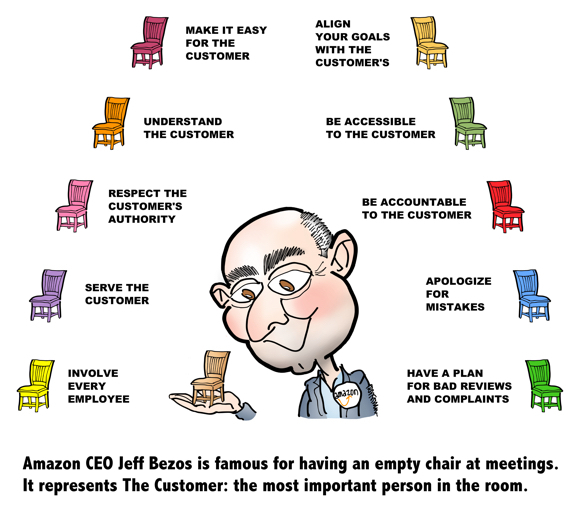 Understand the customer: Amazon managers, including Bezos himself, attend 2 days of call center training every year. It’s a dramatic reminder that company success is tied to understanding customers and their needs. Involve every employee– not just those on the front lines of customer service. Everyone in the company needs to be committed to the needs of the customer. Be accessible: if customers can’t contact you when they have a problem, you’re sending them a clear message: don’t bother us, we don’t care. Apologize for mistakes: nothing diffuses a situation like a heartfelt apology– like this one that Bezos himself posted back in 2009. Have a plan: Bad reviews and complaints will happen— be ready for them. Never fail to respond, and always thank customers for their feedback. Oh– one more thing: always carry a little chair with you so you can offer people a seat. You might also enjoy these infographics on content marketing and how to choose the right visual artist for your brand. Do you worry about customers posting negative comments online? Are you prepared to respond? Ever had to apologize to a customer for a serious lapse? How did they react? I think customer service becomes part of your brand: good service => referrals => new customers. Would you agree? And this was tagged as Humor because…? 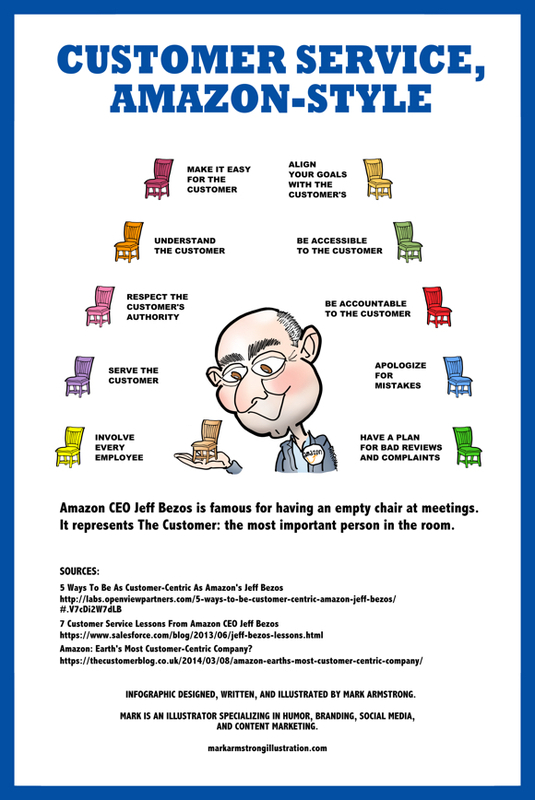 I totally agree about Amazon’s customer service – it’s topnotch at all levels. I just wish their site’s navigation didn’t slow down my brain! So many options, sort fields don’t work, poor/ incomplete item info., lack of photos, no manufacturer videos to help, no price protection plus prices aren’t always competitive…..all-too-common for most Canadian counterparts of US companies. 😦 So, except for books, e-books, product reviews and Marketplace aka weird but useful stuff only made in Chai-nah!, Amazon Canada isn’t yet a “go-to” site. Given their recent, heavy push towards Prime memberships, they’re moving in a direction I couldn’t really care to follow. My dear Radhika! Thank you for that Amazonian comment! I shall take a digital cab to the Amazon website, where, after some uncertain navigation, I shall– eventually– order you a pair of official Wonder Woman Amazonian bracelets to support your wrists– they must be tired after all that typing! Hope you’re having a great summer, and, as always, lovely to see you. P.S. Just curious: do you pronounce tarra as ‘churar‘?? I’m trying to remember customer stories…. anyway.. I have a non -controversial blog but I have had some inkling for 1-2 blog visitors of male sniping in a different language over a post on feminism and cycling. Hi, Lily! Many thanks for your kind comment, always so nice to see you. Yes, that Empty Chair symbolism is very impressive. It sets the customer service bar very high, but it’s hard to imagine a premise, an idea, that could cast a company in a better light. A combination of ideals, lofty goals, and brilliant marketing. And it certainly shows the power of a simple image. My dear RK!! Thank you so veddy mucho for your off-the-scale kind comment, and do excuse this tardy reply. Yes, I had a lot of fun with that infographic. I was a bust at shop class in school. I couldn’t make a chair to save my life, but at least I can draw one, and copy and paste it as needed! !